Offseason training sets the tone for what the Bulldawgs hope is another title run. 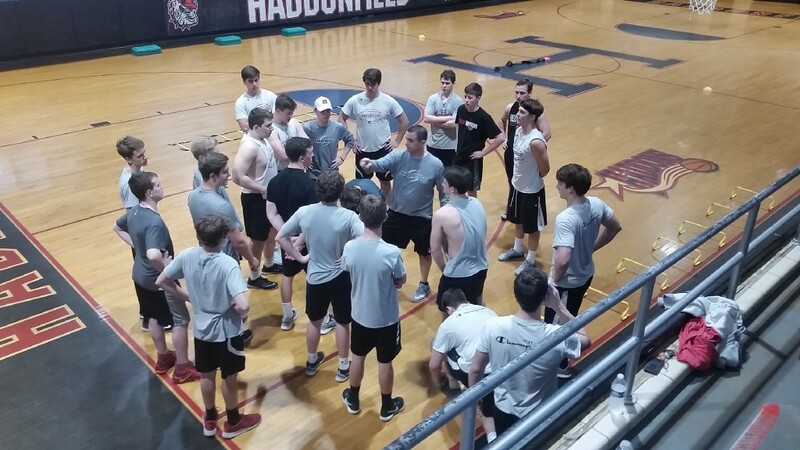 Haddonfield head football coach Frank DeLano gives instructions to his players before they start agility drills. Haddonfield Memorial High School head football coach Frank DeLano says he still remembers what it was like in 2014 when his Bulldawgs captured the NJSIAA South Jersey Group 2 Championship, blowing through the three-round tournament outscoring opponents 102–7 and finishing with a 12–0 record. It was DeLano’s third Group title in five years, the school’s only state football titles since the NJSIAA started keeping records in 1974. Over the past two seasons, Haddonfield has been good but no championships. DeLano wants his 2017 squad to visualize what it’s like to win a title and transfer those thoughts into results. DeLano paused for a second. DeLano says he knows it is never easy. He knows he has to take it one game at a time, one practice at a time. He says he wants use the spring and summer training sessions to find and develop leaders each season. The long-time head coach says there is nothing wrong with enjoying the process, the journey he and his team must undertake. Some coaches and student-athletes will say they like practice as much if not the same as the games themselves … does coach? DeLano is a no-frills basic coach when it comes to training. Haddonfield is a small school so he does not have the numbers of schools such as Williamstown or Cherokee. But the goals are the same. Unlike many coaches, he likes it when his guys play other sports at school. “Traditionally, we have athletes here,” DeLano said. “We don’t have a ton of kids out here in the weight room. There are other weight rooms and they have 50, 60, 70 kids in there. Then you’ll see some other schools that only want one-sport athletes. “We want our kids playing something else,” DeLano continued. “We could go out there and do tug-of-war, flip tires, we could do all kinds of stuff … but it won’t seem like competition. Like any sport, football is a fraternity. Winning teams usually are the ones that bond during the offseason. It’s hard to point the finger at a teammate during some tough times of the season if you like him or her. For DeLano, there is nothing cheesy about bonding. DeLano continued his passionate answer about team chemistry. DeLano recently won a lifetime achievement award from the Haddonfield Alumni Society at the age of 40. He was named New Jersey State Coach of the Year in 2010 and was inducted into the South Jersey Football Coaches Hall of Fame in 2015. He continues to preach chemistry as the key to success. DeLano may sound like he puts a lot, maybe too much, emphasis on the mental aspect of training, but he does have training philosophies and they are more than current: Core work, stretching, being flexible as well as strong. He likes training disciplines that transfer to football. There was only one flat bench in the weight room, a sign he wants his players to focus on weight training that will make them better football players. “That is correct,” DeLano said. “You better be strong in your core, you better have some flexibility, you better be dynamic with your squat, you better be able to clean. And there’s that argument that what’s more realistic — flat bench or incline bench? What’s more football specific? DeLano says he has 21 letter winners returning from last season’s team that finished 4–1 in West Jersey-Colonial League play, 6–4 overall. Seniors he singled out include center/DT Will Murray (6–0, 230), running back Ben Klaus (6–1, 175), fullback Will Ciemny (5–10, 175) plus quarterbacks Jack Flannagan (6–0, 170) and Jack Mooney (5–9, 130). Those underclassmen include sophomore quarterback Jack Narducci (5–9, 145) and brothers Johnny Foley WR, SS (6–2, 175) and quarterback/free safety Jay Foley (5–9, 165), both juniors, whose father Glenn Foley played quarterback at Boston College and in the NFL with the New York Jets and Seattle Seahawks. Coach said he expects the battle for the starting quarterback spot to be spirited. DeLano made it clear he loves having the elder Foley around to share his experiences, but says he puts bloodlines aside when it comes to deciding who plays where. Delano said if a kid is talented and there is a log jam at his position, he’ll find a way to get him on the field. One thing is clear, the Bulldawgs are eyeing a ride on that fire truck again this fall.